​﻿﻿﻿﻿﻿rug plant cleaning, home rug cleaning and upholstery cleaning that is safe for your family and the environment. We combine Green Seal and other eco-safe products to thoroughly clean the carpets, upholstery or floors in your home or business. for your family or business. My experience was great from the start. The appointment was scheduled promptly, and Mark communicated thoroughly. He showed up on time, and was pleasant during his time in my home. I was blown away when the first thing he did was move my clunky sofa and clean all of my daughter's toys and fallen snack bits from underneath. The carpets were cleaned very quickly, almost odorlessly, and nearly dry by the time he was done. He also cleaned the sofa that has been in my child's life from age one to four, and it looks practically new. 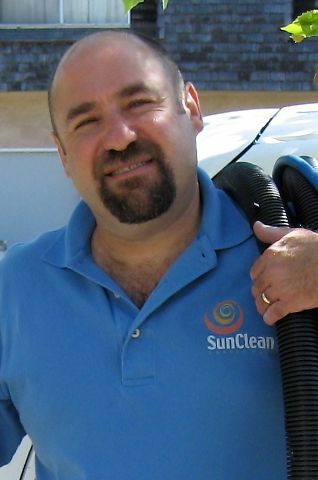 I would absolutely recommend SunClean to everyone in their service area, and will be calling them next year. Just a great experience overall. I requested a quote to clean my sectional couch on the website and got a reply the same day with a very reasonable estimate and available appointment times. I asked a couple questions, got prompt and thorough replies, and booked a cleaning. He was right on time, explained everything he would be doing, and was completely professional, friendly, and warm through the entire process, which took a little over an hour. The hubby and I were so pleased with the results that we plan on having him come back and do this semi-regularly (until our toddlers are old enough to stop assaulting our couch and rugs). Mark cleaned our sofas today. And they look really good. (I love that he used only non-toxic, green cleaning products.) Mark was punctual, professional and really, I couldn't have asked for better customer service -- from beginning to end. It was easy and quick to get an estimate from him over e-mail, the scheduling was efficiently handled, he arrived right on time and was very pleasant to deal with. I really appreciated that after he left, he called to remind me that he'd left my windows open. Thanks for being so professional, Mark! dimensions of rugs, is there dog soiling or smells, other concerns?